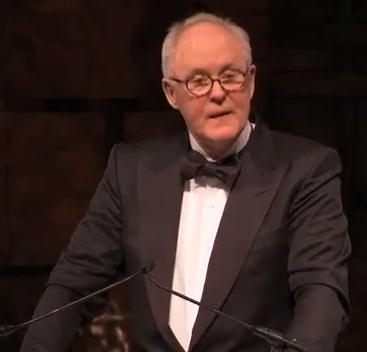 John Lithgow giving the keynote address for the National Arts and Humanities dinner in 2012.
civil discourse, self-knowledge, empathy, the habit of learning, and yes, the capacity for joy, are indeed learned skills and that they can be most effectively taught to young people through the arts and humanities, and I believe most fervently that the health of a democracy absolutely depends on these qualities. Picture a flower, a big bright flower in full bloom. The flower’s stem is STEM (science, technology, engineering, and math). It is the superstructure, the infrastructure, the support system of the flower itself. The arts and humanities are the blossoms, of course–the source of the flower’s beauty, its fragrance, its identity, the visible mark of its health, and the wherewithal of the flower to reproduce itself. The stem is functional, strong, and essential, but pare away the blossom, and the stem has no purpose, no function, no value. In time it will wither and die. It cannot survive the loss. So much for STEM. The arts and humanities are our bulwark against fear. Tonight’s honorees don’t avoid harsh truths, they engage us. They don’t divide us, they connect us and reveal to us our common ground. Their gifts to us are a mixed bag, but what a glorious mixed bag it is. And what gifts. More details at the Washington Post. This entry was posted in Community engagement, History and tagged Commission of the Humanities and Social Sciences, Humanities, John Lithgow, STEM on March 9, 2012 by Max van Balgooy.